A typical whistle style air mover moves air around room adequately drying carpets throughout a room. The Dri-Eaz Studebaker AirPath downdraft air mover draws warmer, drier air from above and disperses it evenly across an entire room. Take a look at our highly sensitive time lapse pictures below for an adequate display of how our Dri-Eaz downdraft air mover dries carpet, versus a standard whistle style air mover. 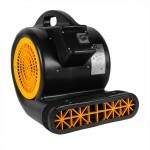 Our standard downdraft axial air movers do the job of 2 standard air movers in half the time! Save time, labor, and money, by not having to return to a customer's residence to retrieve your air movers. Leave the job with your customer's carpets dry! Quiet 2-speed design, up to 3520 cubic feet per minute (40 MPH) of air velocity in all directions. Patented 360 degree outlet grill design disperses air in all directions. Studebaker AirPaths are stackable for easy storage and transport. Polyethylene housing protects internal components from damage and rusting. Highly portable with locking caster wheels. Large fan impeller maximizes air flow with greater efficiency. 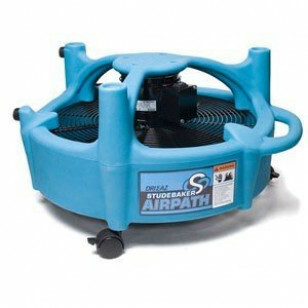 This is a review for the Dri-Eaz® Downdraft Studebaker AirPath Air Mover.